Finding the best walker for you or someone you care about can be a challenge. I did the homework for you and listed my top 10 picks for walkers in 2017 below. From heavy duty to light and portable, the walker for you is just a click away. Don’t want to read the whole article? No problem! Just click in the table of contents to view what’s most important to you. This walker is just plain incredible. It’s one that I would recommend for almost anyone and why it’s my number 1 pick. Pros: It’s adjustable. That’s huge! When you buy a run of the mill walker, you are getting a one size fits all and that is not what you want. The Hugo will let you adjust to your height making sure your ergonomics are on target and you don’t suffer injury. The seat has a really nice back to it. This make it comfortable if you need to sit down for a break instead of teetering on a seat that you barely fit on. With it’s extra large wheels it can go just about anywhere. This is one rugged walker but it only weighs 15.4 pounds. That’s a novelty to find a walker that light weight that still has the durability of a 50+ pound walker. If you want to learn more on the Hugo Explore Side Fold Walker, check out my review! Cons: It’s tough to find faults in this one folks. The only thing I could really find is that if you are a petite person, you may have a hard time folding it up and getting it into your car. Now, that’s only a few people’s opinions. For the most part, most customers have said they find it easy to do. Verdict: I bet you can see why this is my #1 pick for best walker. I think that the safety features are stellar, the durability is incredible, it’s light weight, it’s fashion trendy, and it’s comfortable for people ranging from 5′ to 6′ 2″! You can’t go wrong with the Hugo Explore Side-Fold Rollator Walker. Head to Amazon now to get yours today! Pros: Another great purchase option here. It has similar capabilities and function as my 1st choice but just a tad less luxurious. It too is fairly lightweight at 17.5 pounds and boasts easy to fold up and put in your trunk. I like the seat having a nice size as well as having a soft back for comfort. It is durable enough for both indoor and outdoor use. You can adjust the height making it ergonomically practical. Want to learn more on this model? Check out my review here! Cons: Less support on the back than the Hugo. There have been customer complaints of the wheels breaking down after a year or two. This could be from excessive outdoor use, or potentially braking too much. However, it should be noted as a potential flaw! Verdict: Overall, I think this is a great choice for those looking to get a high quality, versatile walker without spending quite as much. Check out more specifications and reviews on Amazon now! Pros: I love this walker for the petite little ladies. It is adjustable but it is meant for those up to 5’4″ (Wow! I can’t believe I’m in that category!). It has a nice seat and a compartment underneath to place your belongings. Want to learn more about the GetGo Petite Rolling Walker? Check out my review here! Cons: While I like the seat, there isn’t much of a back to it. I don’t like that because if you are using the seat due to instability, it’s not comfortable and presents a fall hazard. However, if you are fairly stable, it won’t be an issue. Verdict: This is a great walker for the petite ones out there. Finally something that fits you where you feet don’t have to dangle and you don’t have to reach above shoulder height! Head over to Amazon to check out their low prices today! Pros: I like this walker because it is a good price for those who aren’t able to spend a lot. It also has the amenities of a bigger and better walker. It has the ability to be a seat with a cushioned back which is always a plus in my book. Learn more about this walker wheelchair combo by reading my review! Cons: I don’t like that the wheels on this walker are not incredibly durable. In some reviews, patient’s have claimed that they are not safe for transport. Verdict: This is a great walker if you need a little bit less expense but are still wanting a great quality. Pros: If you are a larger person, this is the walker for you. It’s extra wide so you can actually sit down. It’s wheels and the frame will hold up to 375 pounds. It has a nice cushioned bar for the backrest on the seat. Overall, a great buy for a heavier or larger person. If you want to learn more, check out my review here! Cons: It’s positive is also it’s negative. It’s a big walker. This can make it harder to transport, get in and out of doorways, etc. Other than that, the only other downside is that it’s also made with a taller person in mind. Verdict: This is a great walker for a larger person and is recommended for use as long as it will fit through your doorway! Look at the great price available on Amazon now! Pros: I like this walker because it’s durable! It’s 8 inch wheels give it the option to go over all sorts of terrains. It has a comfortable sitting area as well with it’s back and arm cushions. I also really like the capability to lock the chair. If you fall, you can lock the brakes and get back in the seat. Learn more about the HealthLine walker by reading my review! Cons: There are complaints that there are no assembly directions that come with. I believe the manufacturer has fixed that now, and if not, a simple call will get you the directions. It also is not for people well over 6 feet tall. Verdict: This is another great buy in the walker arena. I would purchase for moderate use in the home and outdoors. Check out Amazon’s prices now to get a hot deal! Pros: This is a brute of a walker. It’s made to take some abuse with it’s reinforced frame. I love that it’s capable of handling a large person while still maintaining a nice look. Often times, that’s not the case. It’s tires are also quality and can get you around no matter your environment. It has a great cushioned seat and back rest to help accommodate those rest periods. Read more about the Comodita here. Cons: This one’s tough. The only negative feedback I have seen is the price. Well if that’s the only complaint, it’s worth every penny to me. Verdict: The BEST purchase for an extra wide walker. Check out more information on Amazon now! Pros: This is the walker for someone that is obese or if you have a patient that is. It’s ability to take the weight of 500 pounds is incredible. It has really durable wheels as well which will help go over more than just carpet. Read my review on the Invacare walker now! Cons: There are complaints that the seat only has one position. So, if you want to sit down, and it’s not at a comfortable height, it can pose an issue. Also, some patients have stated the wing on the handles can be bothersome. Verdict: This is the walker for any obese patient. You are going to be hard pressed to find another that suits their needs! Look at more reviews on Amazon now! Pros: I love this walker for it’s wheelchair feature. It is even really great to step in for support. Just lift the seat! Next to my first pick, I would say this has the best back support and sturdiness. It also comes in a variety of different colors to suit your lifestyle. Bonus! Read my review on the Medline Empower Rollator here! Cons: The only negative I can find on this one is that is heavier. It can be difficult to lift up into a vehicle if you need to transport it. Verdict: I love this walker for someone who is not overly weak. Take a look at all the other features this walker offers on Amazon now! Pros: Price is the best thing about this walker. It’s really affordable. It also still made my list as far as quality goes. It’s by no means as fancy as my top pick, but if you are in a pinch, this will get the job done. I also really enjoy a 3 wheel walker for many reasons. They are easier for some to maneuver, can get into tight spaces, and fold easier. Check out my review on the 3 Wheel Trio Roller Walker here. Cons: This walker is not for larger people. It also just doesn’t quite have the durability or sturdy structure like my other top picks. Verdict: This is a great purchase if you are short on cash! Take a look at this hot buy now on Amazon! The best walker for balance is the Hugo Explore Side. It’s wide enough and durable enough that it gives you a nice window if you start to lean any direction. There are a few walkers that are great on multiple terrains. My #1 Pick would be the Hugo, but the Comodità Spazio Extra Wide Heavy-Duty would be a close second! Again, I have to go with the Hugo Explore Side, but I also really like the Comodità Spazio Extra Wide Heavy-Duty, the Medline Industries Empower Rollator, and the Drive Medical Nitro Euro Style Red Rollator Walker too. They all have a great back rest, but I like the Hugo the best. All of my top 10 walkers have breaks, so this is a non-issue. If you are looking for a comfortable grip, I would go with either the Hugo Explore Side or the Drive Medical Nitro Euro. All of the walkers on my list are great at helping to prevent falls. However, if I had to pick a top 3, I would choose: The Hugo Explore Side, the Drive Medical Nitro Euro, and the Comodità Spazio. This is such a great question! I think that the Hugo Explore Side is a great walker for those who have Parkinson’s disease. I also think the Medline Empower Rollator is a smart choice due to it’s wheelchair and locking capabilities. Generally, if you are traveling, the smaller the better. I think the best walker for this is the Drive Medical Nitro Euro Style Red Rollator Walker. 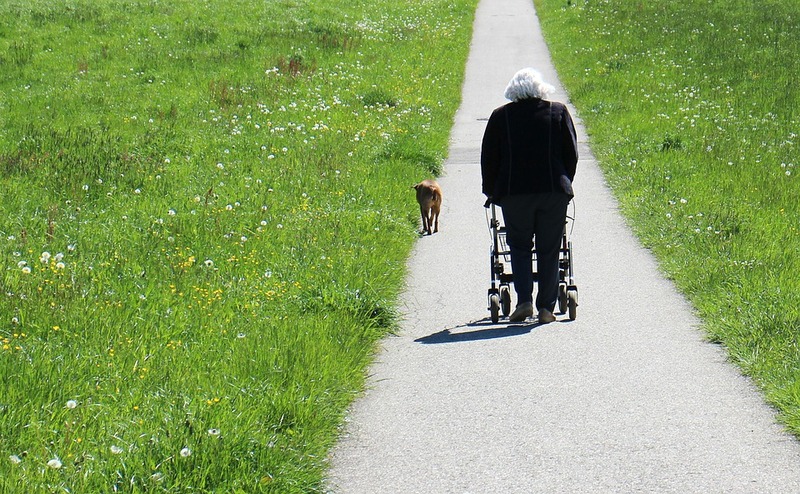 The best walker for a stroke patient is similar to the best for a Parkinson’s patient. I would say the Hugo Explore is great but the Medline Empower Rollator is a very close second. You will want something sturdy, a comfortable and strong seat, and wheelchair capabilities. So, which walker is right for you? It all depends on your needs. Are you going for the best you can find? Then you will want to go with the Hugo Explore Side- Fold Rollator Walker. Using my guide, you should be able to narrow down the best walker for the person that will be using it. When you are purchasing a walker, keep in mind that you are going to be using it every day. It’s something that you are investing in to make your quality of life better.